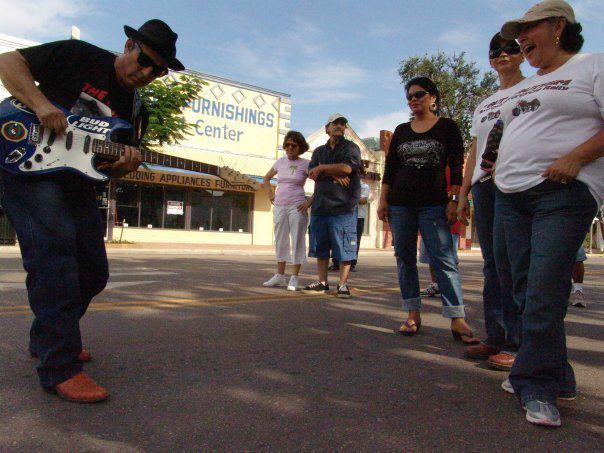 Local Mercedes artist, Kid Zapper performing off stage with his audiance at the first Texas Street Festival held in 2008. MERCEDES — Bring your lawn chairs and enjoy a day of fun and Grammy award winning music at the Texas Street Festival. This year, organizers expect more than 10,000 people will be attending the downtown party for people of all ages. “Being that this is our 10th annual Texas Street Festival, we decided to add more to the lineup this year and scheduled four big bands,” said Armando Garcia, Chamber of Commerce vice president. Hometown music artist Elida Reyna Y Avante is one of the headlining entertainment acts scheduled to perform in the evening. Also sharing the stage are the Hometown Boys, Fito Olivarez and Solido. The event will also host a community stage where local music and dance artists will perform throughout the day and night. “We have a little bit of everything and it’s an event you’re not going to want to miss,” Garcia said. The one-day event will take place in Historic Downtown Mercedes on Texas Avenue between Business 83 and Fifth Street and will include two stages, food, drink, crafts and informational booths. “This is the largest Labor Day festival south of San Antonio,” Garcia said. He said there will be a kids area, car show, a train, different business mascots, dancers and many more fun things to do. Entertainment will start at noon and last until midnight, and will feature an array of musical artists and also offer a stage designated for the local community. This year marks the 10th annual Texas Street Festival hosted by the Mercedes Chamber of Commerce, Economic Development Council and the Rio Grande Valley Livestock Show. Garcia said 10 years ago, city leaders came up with the idea to make the Texas Street Festival the city’s signature event. “It is a free family oriented event and an attraction for the entire Rio Grande Valley,” Garcia said. In the evening, professional wrestlers will be battling each other in the ring while the headlining acts take the main stage. “Children will be able to enjoy free carnival rides and there will be vendors and food trucks selling spiral potatoes, onion blossoms, BBQ sandwiches and more,” Garcia said.